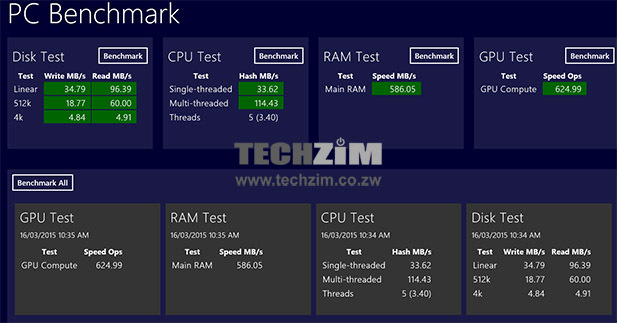 Home » Connectivity » The Gtel T 9000: Windows device at its core, or a tablet with choice ? While the bulk of manufacturers and suppliers are focusing on Android devices, local company GTel has once again opted to be unique. It has done this by giving customers a chance at using Windows as an OS for their tablet. The merits of this are that most of us are already familiar with the Windows ecosystem, no matter how “different” Windows 8.1 is. The Windows tablets have not had much success on the market, mostly because of the increased cost of the operating system which in turn makes the tablet pricing poor compared to its rivals. Microsoft changed this by making its operating system license free for devices with screens smaller than 9” (this includes phones and tablets). Gtel packs this tablet with a wireless keyboard, which is handy for your extended periods of typing. There’s also the charger and a USB cable for connecting the tablet to your PC. Unlike Android tablets, you cannot directly connect your tablet to the PC and copy files, instead you need to have software to copy files to the device. An alternative would be to do some networking using a wireless router to connect your PC to the tablet. The tablet comes equipped with an Intel atom quad core processor which is no slouch and 2GB of DDR3 RAM which is quite quick. The onboard storage operates at speeds similar to many mechanical drives. While high-end solid state storage can be a lot faster, the higher speed drives would raise the price to a figure that is a lot higher than what it is. The operating system boots to the desktop in about 15 seconds which is a lot faster than a lot of desktops out there. The body of the tablet is quite well designed, with an aluminum black and silver ring, with red accents for the sides. The front and back have glass on them reminiscent of Sony’s design which gives a really premium feel and looks rather good. The only downside on the tablet is the weight, which is rather hefty for a tablet. The SIM slot and the micro-SD card slot are both accessible using a tray which can be pulled out using the supplied SIM tray remover tool. The T 9000 comes with no software, aside from the regular Windows apps that come with Windows 8.1. On the plus though, the version of windows installed is the 32 Bit x86 version. Which basically means you can move all your 32 Bit desktop apps right over to the tablet. The result is that unlike the ARM versions of windows which are restricted to the store, you have the plethora of apps that is able to run on the desktop version of Windows 8.1. The one annoying bit for the tablet again is the ability to connect it to your computer in order to copy files, hopefully Gtel will provide software to help make access to the T9000’s storage much less of a hassle. Remembering that this is the desktop version of Windows 8.1, forget having the phone functions that the android family of tablets usually has (yes that means no WhatsApp). Instead, the T9000 is designed for one function/purpose; productivity. With this tablet, all your office apps are going to run as long as they run on Windows 8.1. That means you truly are able to work on the go without worry of trying to integrate the system with existing platforms. The T9000’s display is quite good, carrying a display resolution of 1920×1200 which is approximately 254ppi on an 8.9” tablet means that images are sharp. I found the whole process of changing screen brightness a little out of the norm and somewhat difficult to get used to. Unlike android tablets where the notifications panel also acts as quick settings access, the Windows system is a bit more of an activity and requires one be a bit acquainted with OS. The brightness of the screen was quite good though, being very visible both indoors and outdoors. I also found that the T 9000 has rather good viewing angles, meaning you do not always have to be facing the screen overhead in order to use the tablet. 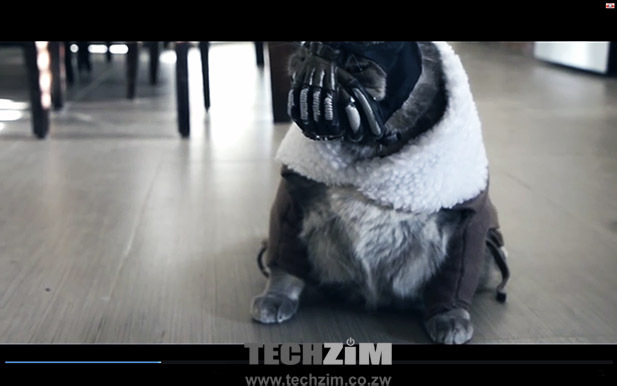 The T 9000 comes by default with the normal Windows apps which have limited media file support. However, since this is the desktop version of Windows, you can use your normal desktop apps to watch videos. The only problem comes with the apps not always being optimised for tablets. The result is that unless you have the keyboard it is sometimes an awkward affair to use the apps. On the plus, it is easy to get any and all codecs for your media files. The media experience on the tablet was a bag of mixed feelings. On one hand the T 9000 comes with a good display, on the other, the side mounted speakers do not complement the display all that well because low output of the volume. When sitting in a room alone, the T 9000 would have sufficient volume levels, however in a room with people the speakers are barely audible. Like many tablets, the T 9000 has a decent 5 MP camera, one sufficient for quick snaps. However it is not by any means a DLSR camera, nor is it a camera like those found in flagships. So if high-quality images are needed another device would need to be acquired. The Camera has no flash and performs rather poorly in low light situations. The front camera works well for video calls and for the quick selfie while doing any social networking. I found the 8000mAh battery sufficient for general use, with an hour of video consuming about an hour of battery with medium to low screen brightness settings. The time drops a bit more when browsing, depending on what pages are being visited, flash video consuming the most power. For regular work like typing, the battery will last you the day assuming that the Wi-Fi is turned off. As far as Windows tablets go, the Gtel T 9000 seems like as good a bet as any for one to go with. The model that Gtel has made available is quite responsive, its one major drawback being that it is a little on the heavy side. On the plus, you have a tablet able to install all the 32bit apps you have on your laptop, but is much more portable than the laptop. 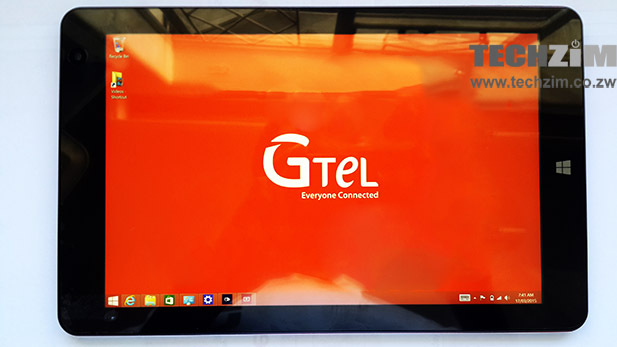 Gtel is offering the tablet for $450 or $600 on terms payable in 12 months. The package also includes a wireless keyboard that makes the whole activity of typing a whole lot less cumbersome than it would be on screen. Another plus is that updates are handled by Microsoft, so you are sure to be supported with updates for any issues that Microsoft would identify as opposed to the situation with Android which leaves updates to the device manufacturer. The price and the software support would make this a rather good buy for students and business people looking to keep productive while on the move. One thing to note, the box says you can choose between Windows and Android. However, it seems that the user is restricted to Windows. While the Windows experience was quite good, the absence of choice in the end is a bit of a disappointment. Supreme Court dismisses Econet legal action: How does that affect us anyway? Back on topic, the cash price makes it a better value proposition than what i initially concluded from your teaser article. Unfortunately for some like me, working on the go on a tablet means using surface pro level hardware, all academic really since the t9000 and surface beynd my means right now. Surprisingly enough, for pure media consumption and web browsing, i found the disowned blackberry playbook quite compelling: it has a great screen, lovely front facing stereo speakers, great native codec support and build quality. I was so impressed with it I’d consider it even now, dead end software and all! windows os on gtel,thats awesome….does it have windows 10 update? 1) G Tel’s tablet pc is more expensive compared to actual new and used laptops from a number of brand names! There a popular Laptop Shop in Newlands shopping center where the base price for most of the laptops is 320! PC’s with 4GB ram and 500HDD! So getting a laptop is far much better! 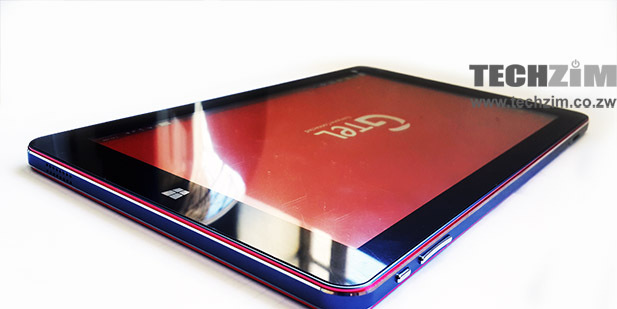 2) The gtel tablet has nothing that makes it a high end tier tablet. Infact, it has the same specs as the HP 8″ Stream or iView 8″ tablet for 5 times the Price! What’s worse is the atom z3538 is the same, screen resolution and these come with free office360 . conclusively, the gtel is a worst of money…. entirely ! The problem with them is that they want to take advantage of their monopoly but thanks to free import on tech gadgets I’ll never buy a GTel product for more than $120! ever!